Are you an aviation enthusiast or pilot? 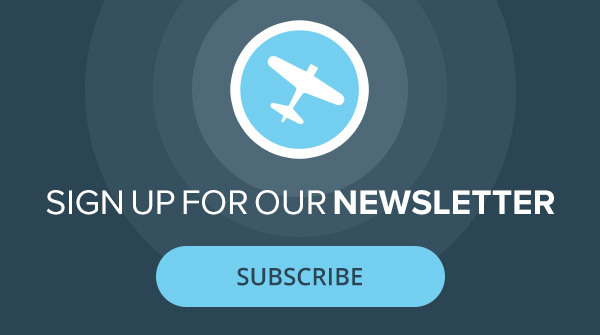 Sign up for our newsletter, full of tips, reviews and much more! When Cirrus Aircraft launched its G6 model last January, I was impressed, and I’m not the kind of pilot to get easily impressed by an SR22. But the G6 was something different. Even with many of its advances—better flap speeds, room for three in back, and a great fit and finish—the G6 was that much better, and the new G1000 NXi avionics completed the upgrade. It gave the distinct impression of an airplane reaching the pinnacle of development after more than 15 years of production. I’ve known the folks at Cirrus Aircraft since right around the time they were getting started with their first airplane, the VK-30, back in the early ’90s. If you’ve never heard of the VK-30, you’re probably dating yourself as a younger or newer pilot, just like I was back then. One of the best traits of young people is their natural optimism, which they retain simply because they haven’t seen what are promoted as great new ideas in aviation that fail time and time and time again. They also haven’t seen the development of aircraft that exist pretty much on paper only for as long as possible while the principal and team collect paychecks as long as possible for a design I often suspect they know full well will never fly, sometimes in the figurative and sometimes in the literal sense of the word. As a new journalist back then, I didn’t know what I didn’t know, and I was on board for a lot of these eye-popping developments, so when a pair of brothers from the Midwest, Dale and Alan Klapmeier, dreamed up a whisper-thin-winged single engine pusher plane with a mid-engine and a mile-long prop shaft, I saw no reason it wouldn’t be a smash hit. And in all fairness, the main beat I was covering was homebuilt and sport aviation, a world where wild dreams really do come true, at least for a few airplanes. And if they don’t, the developer isn’t out millions of dollars, with few exceptions. The VK-30 never panned out. It faced a variety of propulsion complications that made the brothers rethink their plans. Wisely, they shelved the VK-30 production and tried something new. There are aerodynamic, propulsion and systems limitations to new airplane programs, which is why new airplanes you can pretty much bank on being successful all kind of look like a bunch of other successful planes that came before them. In addition to physical limits on design, there are also financial realities of developing a new airplane, realities that are, if anything, even more iron clad than physical ones. So when a new model emerges from a new company with plans to transform the GA world, the chances of it succeeding aren’t zero, but they’re not far from that. So when, fresh off the lessons learned from the VK-30, the Klapmeiers launched a new program, lots of pilots were excited to see how wild the new plane would be. And when the new plane, dubbed the SR20, arrived, it was a bit shocking for how wild it wasn’t. With four seats arranged two in front and two in back, and with the engine in the front and the wings mounted below the fuselage, the SR20 might as well have been a Piper PA28. And with Cirrus being a startup with an expensive certification program ahead of it, the chances of this new plane succeeding were slim, indeed. A closer look at the SR20 revealed a lot more than initially meets the eye. As just about everybody knows, the plane featured a whole-airplane-recovery parachute system, which would lower the plane, occupants and all, safely to the ground in the event of an inflight emergency if the pilot were to pull the big red handle located just over their head. The plane was composite, though the original SRs had very little carbon fiber and instead used fiberglass—today’s Cirrus airplanes are predominantly made of carbon. The plane had a side yoke, not a sidestick, to open up the area in front of the pilot and right seat occupant, and it also incorporated glass panels—well, one glass panel at first, an impressive multifunction display manufactured by Arnav. These innovations might as well have been part of the company’s mission statement, and to say there was resistance to them in the industry is a huge understatement. Pilots used to conventional sheet-metal construction were skeptical about the fiberglass; others weren’t happy with the side yokes. Still others thought it silly that the plane, which was intended to be speedy, would have fixed gear. But it was the rocket-powered recovery chute that upset pilots the most. Their feeling was that it took something away from the experience of being pilot in command, and many worried that lots of pilots who shouldn’t be in a high-performance plane would freak out over something minor and pull the chute. Regardless, Cirrus made it standard in the plane and, at the time, insisted it wouldn’t and would never sell airplanes without one, a promise that more than 7,000 planes down the line it has kept. Even its single-engine SF-50 jet has a chute. The results of the decision to go with a chute, which had never been done before on a certificated airplane, was really bold. Admittedly, ballistic chutes had a good history and track record in the Experimental sector, though on much smaller and lighter airplanes. On the Cirrus, the chute performed extremely well, doing everything that Cirrus and partner BRS said it would. More importantly, the technology has saved a lot of lives for a wide variety of reasons. And while the critics worried that many pilots would use the chute when they didn’t need to, that hasn’t come to pass. There are a few instances where it might have been the case, but in the vast majority of “pulls,” as Cirrus refers to them, the pilots pulled the lever in exactly the kinds of dire scenarios that the company predicted early on. And, besides, if there were an untimely pull or two, the only thing that gets hurt is the insurance company’s bank account. The chute also served an extremely important function in selling the airplane. A lot of pilots, me included, like flying with a chute. After all, it is a single-engine airplane intended for IFR flying and going long distances. A chute makes sense given those parameters, a lot more sense, for sure, than resigning oneself to a forced landing and hoping for the best. Arguably even more importantly to Cirrus’ success was the psychological effect the chute had on spouses, many of whom weren’t pilots and didn’t know a lot about airplanes but who really, really liked the idea behind the chute. In a way, the chute takes the place of a second engine on a light plane. One of the main purposes of having two engines on a plane is that if one fails, you’ve still got one to fly to safety with, though there are countless examples of fatally flawed attempts to pull this off by pilots who for some reason lost control while flying on just one engine. The chute isn’t going to motor a powerless Cirrus anywhere, but it will bring the plane back down to earth safely if it’s deployed within its operational envelope, or even slightly outside of it, though Cirrus probably wouldn’t say that out loud. So while it’s probably impossible to say with certainty how many airplanes Cirrus has sold as a result of a chute being in every one of them, there’s little doubt that it’s a big number. Other design elements, the fixed gear (which reduces insurance costs and complexity) and the huge cabin were surely a big part of the plane’s success, too. As was the styling. It might be a conventionally configured plane, but it’s a great-looking conventionally configured plane. 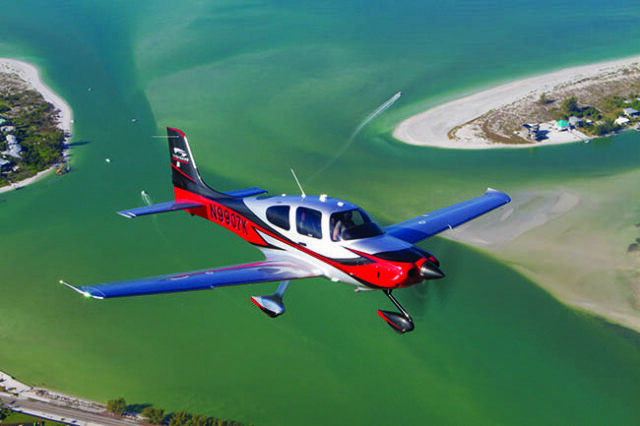 Cirrus introduced the SR22 shortly after the lower-powered SR20, and it proved an even bigger hit than the original SR. The ’22 was originally marketed as an affordable alternative to traditional sheet-metal high-performance singles, but after a while Cirrus abandoned that approach and positioned the ’22 as a premium aircraft. Today’s decked-out SR22s go for around $900,000, about three times as much as the first examples. I’ve got a lot of time in SR22s, around a thousand hours, and I’ve flown every iteration of the plane since its introduction. I recently had a chance to go back in time to fly an early model, though not the earliest, and it was only then that I fully understood how far the new SR22 has come. The early planes felt far less substantial than today’s model, and they lacked nearly all of the technological sophistication, as well. In some ways, it felt like a completely different airplane. And the folks at Cirrus admit as much. 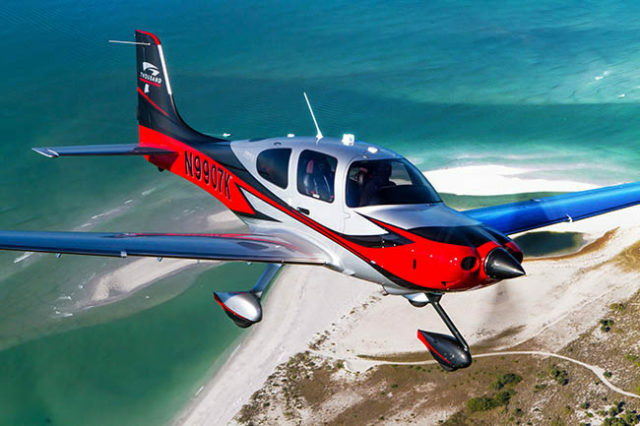 The latest SR22s are way more airplane, better built, more sophisticated, more capable and more comfortable. I went flying with Cirrus Aircraft’s Ivy McIver recently, and in the few short hours we flew, we saw so much of what this plane is capable of. 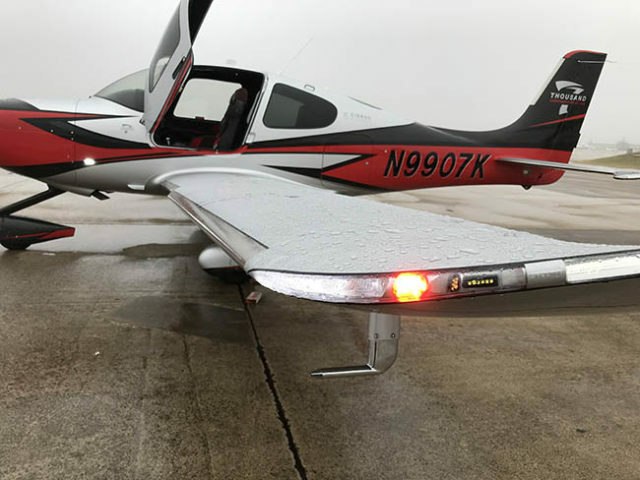 The plane I’d get to fly is not just the latest version of the SR22, but it’s a specially outfitted model customized to celebrate the 7,000th delivery of an SR series Cirrus. The paint, as you can see in the accompanying photographs, is spectacular, and the interior is pretty sharp, too. Cirrus built just seven of these special milestone models and sold them all in short order to customers who wanted not only the latest Cirrus but one that was really distinctive. 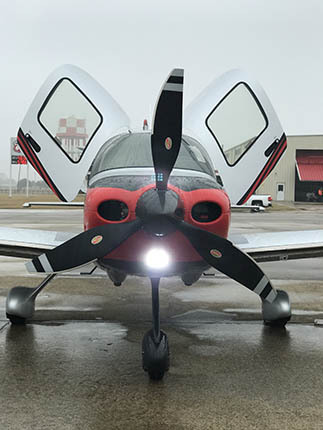 As far as new features on the 2018 SR22, the list is modest by Cirrus Aircraft’s standards. The airframe is identical to previous models, and the avionics are the Garmin G1000 NXi-based Cirrus Perspective Plus, which is the same as on the 2017 models in general, though there are a number of enhancements. There are also nice added touches to the interior, including alternately colored asymmetrical seat panels with contrast stitching for a sports-car look, to go along with a generous allotment of Alcantara leather, some of which peeks out at you through perforated black leather. The Alcantara is a super-durable suede that has all the softness of regular suede while being many times tougher. So while this year’s model doesn’t have any really big upgrades, the improvements from last year’s G6 introduction are so noteworthy that the plane I was flying still seemed very new to me. The G6 has, as I mentioned, the new avionics suite, which does everything the Perspective cockpit did and then some, and it does it faster, with a better-organized menu structure and with far superior processing power, so that tasks like panning and zooming seem to take place at light speed. The plane still has the Cirrus exclusive keypad, which, once you get used to it, makes inputting everything from frequencies to flight plan data easier, faster and less of a reach. Perspective Plus is also connected. You can use Garmin Pilot (or ForeFlight) to input a flight plan and to update your tablet, phone or Garmin D2 Watch from your panel-mount. Among the big improvements that I still marveled over were the improved speeds of the plane. It doesn’t cruise any faster, though it’s still plenty fast, but the flap speeds and chute deployment speeds are all substantially higher. That means you can throw out the first notch of flaps at 150 knots, as opposed to the old 119-knot value. The second notch used to be 104 knots. On new models that figure is up to 110 knots. These changes make a real difference, too, as you can keep your speed up longer while still having the ability to get slowed down when you need to. This helps a lot when you’re flying into airports with scheduled airline service, as ATC frequently asks high-performance singles and light twins to keep their speed up to maintain spacing with the heavy iron. It was a low-IFR day in central Texas when I met Ivy at San Marcos (KHYI) to go flying. The tower had planes taking off and landing on Runway 35, and as we were holding short and waiting to go, a Honda Jet arrived off the RNAV approach to 35, and Ivy and I looked at each other with the same thought: The weather sure looked lower than the 250-feet minimum for that approach, though I’m sure it wasn’t or they wouldn’t have been able to land from the approach. But it was low, and it sure looked lower than the 300-foot ceiling that the ATIS was reporting. As always when taking off from an airport in low IFR, there’s some risk involved, especially in a single. But when it comes to ways to mitigate that risk, the SR22 does it as well if not better than anyone…okay, with the chute, it’s hard to argue that there’s not greater safety than with singles not so equipped. Of course, the chute isn’t going to do much good until you get to 500 feet. The chute might do more harm than good below that altitude, a fact that Cirrus’s factory training stresses. Plus, the plane provides the situational awareness you get with the big primary flight display, triple redundancy, an engine-monitoring page that’s big and bright and hard to miss, and CAS messages that pop up on the PFD to alert the pilot to any irregularities. Still, admittedly, there’s added risk when you take off in low-IFR weather. As we rolled out and gained speed, the nosewheel started getting light, and at right around 70 knots, you just rotate slightly and let the plane fly itself away. At 400 feet, flaps up, and at 500, the call is, “CAPS available,” so you know the chute is there if you needed it. Below that altitude, you ignore the chute and land straight ahead. Or at least straight-ish. The feel of the G6 is pure delight, smooth and solid with little vibration and the smooth power of the 315-hp Continental TSIO-550-K. Ivy, I already knew, had a sweet job—flying these babies around the country and showing them off to an audience she knows is going to appreciate the demo. The weather was bad in every direction, but with nearly 1,000 nm of range, we had no shortage of options, and there was no convective activity anywhere within that big range ring. There was a lot of marginal VFR and even more IFR and low IFR depicted on the 10-inch Garmin displays. We were headed to San Angelo, Texas, about an hour from San Marcos. San Angelo was reporting marginal VFR. It was, in fact, the only airport within a couple hundred miles that was. As we climbed through the thick overcast, it was an easy ride. There were no reports of icing, though the temps were cold enough for it, but even if there had been, the TKS-based known icing protection would have easily handled a couple thousand feet of most icing events. We popped out at 8,000 feet just above the tops, where we immediately started getting moderate turbulence. As pilots do everywhere, we had to decide whether it was worth it to climb another 2,000 feet to get out of the chop or just put up with it for the remaining flight time. Ivy had a great idea. The frequency was pretty quiet, so she asked the Center controller for a block from 8,000 to 10,000, and the controller said sure. We’d climb only as much as we needed to in order to get out of the turbulence, which turned out to be only about 500 feet. The arrival into San Angelo was uneventful, and the landing was, well, just like landing a Cirrus. I’d last flown one a year ago, and before that it had been another year. It was second nature. During lunch, Ivy and I were checking out the weather back at San Marcos. It was 200 overcast with a half-mile visibility, ILS Minimums. We filed for HYI and used nearby Austin-Bergstrom, where the weather had lifted a little in the past couple of hours, as an alternate. Strangely enough, the ATIS was broadcasting 200 overcast and that Runway 35, with a 250-foot minimum altitude for its LPV approach, was lower than that. We asked for and were told to expect Runway 13 and its lovely ILS with its ATIS conforming 200-foot minimums. I clicked the push to talk four times to turn up the runway lights but not all the way up and, after intercepting the final approach course and intercepting the glideslope, watched the PFD as the autopilot flew the approach like we were on rails. Just as my peripheral vision was beginning to pick up the darker hues of the ground below and I was preparing to go missed, the rabbit came into view, and then the runway, right at 200 feet. I popped the autopilot off and landed. It was an interesting flight for me, getting to fly an airplane I know well but haven’t been around for awhile and to fly a mission that resembled more of a quick business flight than a long cross-country odyssey, like one Ivy and I flew just the year before. The combination of the low weather and the limited options made it feel very much like the kind of flight that you want to be able to make, and actually can, in an airplane with the right stuff, provided, of course, that you have the right experience and proficiency, because if you do, it opens up a lot of flying to a lot of places on a lot of days when other planes are staying put. With Textron Aviation retiring its TTx model, the SR22, a high-powered fixed gear traveling plane, doesn’t have a natural competitor in the marketplace any more, and even though at nearly $900,000 the SR22 is a high-end product, the next 7,000 airplanes might come even faster than the first 7,000.